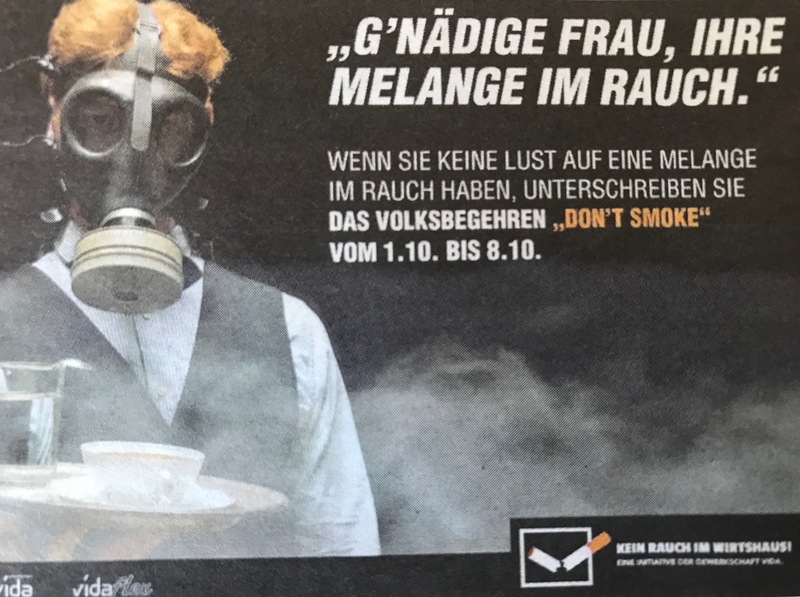 How long will Austria retain its unusually permissive attitude to smoking in bars and cafes? Back in the 1970s I used to ride on the top deck of a double-decker red Routemaster bus to school in Manchester, an hour each way. On winter mornings the air was thick with cigarette smoke, and the windows would mist up with condensation on which we would draw pictures and scrawl messages. No-one thought twice about the health hazards to children sitting in a smoky bus for two hours a day. In 2003, New York introduced a ban on smoking in all enclosed workplaces, including bars and restaurants. Ireland followed in 2004, becoming the first country in the world to do so. In 2006 Scotland followed suit, followed by Wales, Northern Ireland and on 1 July 2007, England, including bars, restaurants, and buses. I remember entering a pub for the first time after 1 July 2007 and finding that the removal of the permanent haze of smoke made it possible to see everything clearly – like converting to HD. It was wonderful to come home after a night out without your clothes stinking of smoke. The smoking ban in England was controversial. But now it is widely accepted. So what about Austria, where I now live? A look at the Internet suggests that Austria has one of the highest proportions of smokers in the EU (behind Greece and Hungary); is one of only two OECD countries where the proportion of smokers did not decline between 2000 and 2015 (the other is Indonesia); and has Europe’s highest level of teenage smokers. A non-smoker myself, I have never been much of an activist on the subject. When people ask “do you mind if I smoke?” my answer is invariably “go ahead”. But – as with smoking in buses – customs change. I recently visited a cafe I was planning to review for my “Best Vienna Cafes” page. It was a Vienna classic and featured in the bible of Vienna cafes, Melange der Poesie. When I arrived, it looked cool. But on walking in, I was enveloped in a cloud of cigarette smoke. I walked around hoping to find a corner where the intensity of the smoke was tolerable; but gave up. A cafe nearby beckoned. I entered optimistically. Just two people were smoking. The smoke was less dense than in the first cafe, but still too much. I sat outside. In Austria, the issue of a smoking ban has become political. In 2017, the newly-elected government withdrew a plan to ban smoking in all restaurants, bars, discos and pubs due to enter into force in May 2018 because one of the coalition parties, the Freedom Party, opposed the ban. Pro-smoking campaigners have, with some success, identified the issue with individual freedoms; and attempts to ban smoking with the “nanny state”. I remember a leading left-winger, author of a recent much-lauded novel, telling me he would be prepared to vote for the Freedom Party because it opposed a cigarette ban. When I discussed my blog “The 3 greatest Vienna cafes?? ?” with a dear friend who is a smoker and cancer sufferer, she said that she would never visit the Cafe Hawelka because it had banned smoking. The “individual freedoms” argument has some logic. Conversely, one may argue that bar and restaurant staff should have freedom not to work in a smoky atmosphere. People have a different attitude at Vienna’s wonderful open-air swimming pools, where visitors are banned from playing music because it bothers other people. I recently observed two tough-looking lads settling down on the grass at the Krapfenwaldbad, getting out a loudspeaker, and turning up the volume. Within seconds, a woman nearby had got up and asked them to “turn the music down, or preferably, off”. Meekly, the young men complied. Whether to ban smoking in Austria is entirely a matter for Austrians. But I avoid cafes and restaurants where smoking is permitted, both for the sake of my health and to avoid my hair and clothes picking up the smell of second-hand smoke. Meanwhile, smoking has been banned on the Vienna public transport system for years. On 1 September the U6 metro line went one step further and introduced a ban on eating food – on the grounds that the smell was offensive to other passengers. By Robert Pimm in Reviews, Robert Pimm on 29/09/2018 .